For publishers, mobile is becoming a mixed blessing, expanding the reach of their content but bringing in much lower advertising revenue than the web. Now Flite, a Sequoia-backed ad startup, is looking to help publishers bridge that mobile monetization gap with the introduction of Touch Ad Studio, a mobile companion to its existing Desktop Ad Studio. Flite’s Desktop Ad Studio has helped publishers such as Conde Nast, Forbes, BuzzFeed and others create dynamic ads that can be updated in real-time and can incorporate third-party apps such as Facebook (s fb), Twitter, YouTube (s goog), PayPal (s ebay) and others. Now, with Touch Ad Studio, publishers already working with Flite on premium web ads can access very similar tools to make engaging mobile ads optimized for touch screens. Touch Ad Studio is launching Tuesday on iOS (s aapl) and is being used by a handful of clients including Forbes and Conde Nast, which is also an investor. CEO Will Price told me that some publishers are seeing 30 percent of their traffic come from smartphones and tablets. But the CPMs for mobile ads can be a fraction of what they get on the web. With ad networks and retargeting technology, it puts even more pressure on publishers to prevent their ads from being commoditized. He said Flite has helped publishers create unique and differentiated ads that have native elements for their publications. That allows them to command higher CPMs, which he believes can carry over to mobile. 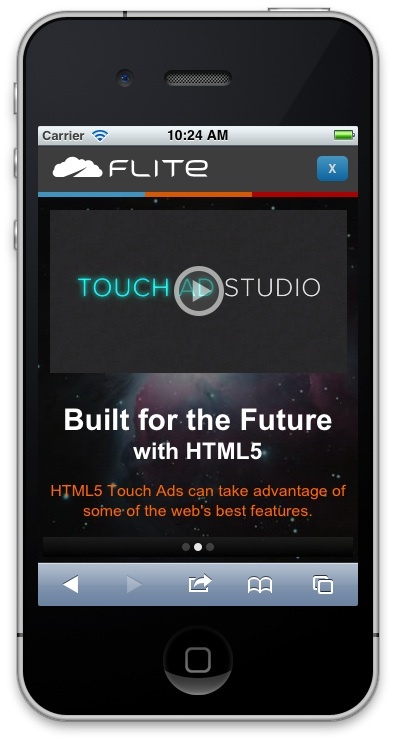 With Touch Ad Studio, publishers can easily create ads that respond to all kinds of gestures and can be updated in real-time so the content is never stale. The ads can include photo carousels, videos and can use apps from Flite Hub, Flite’s collection of third-party applications. The studio, which will be available for Android (s goog) soon, operates like Photoshop (s adbe) and can be used by designers without any programming skills. It also includes reporting tools to see how ads are performing. Flite first launched as Widgetbox, making content widgets before transitioning into building mobile apps. It then renamed itself Flite as it pursued its rich media ad technology. The company has raised a total of $27 million to date including $12 million raised last year from General Catalyst Partners, Sequoia Capital, Hummer Winblad and NCD Investors.